I completely forgot about the 2003 MDD however. Introduced by Apple after the FW800 model this MDD was basically a 2002 first generation MDD with some minor tweaks. Why did Apple dust off older hardware and reintroduce it? An outcry from desktop publishers that needed Mac OS 9 to run the undisputed DTP king, at the time, Quark XPress. Quark refused to update their software for OS X compatibility (the thing that caused their downfall eventually) so professionals were stuck on Mac OS 9 and wanted hardware to run it on. The FW800 MDD (Early 2003) could not boot Mac OS 9 which of course pissed off all of these professionals. To appease them, Apple dusted off the 2002 MDD design and did a small refresh on it in Late 2003. This Late 2003 model is what I fished out of the recycle bin this week. Featuring a newer board design (which means I have an additional port to connect a fan to, that’s really it but it has theoretically less hours on it), upgraded fan which is much quieter, upgraded power supply of 360W which is also much quieter and a case that is in MUCH better shape than mine, this MDD will make a nice home for all my internals from the current MDD. So, a full body transplant must be done! 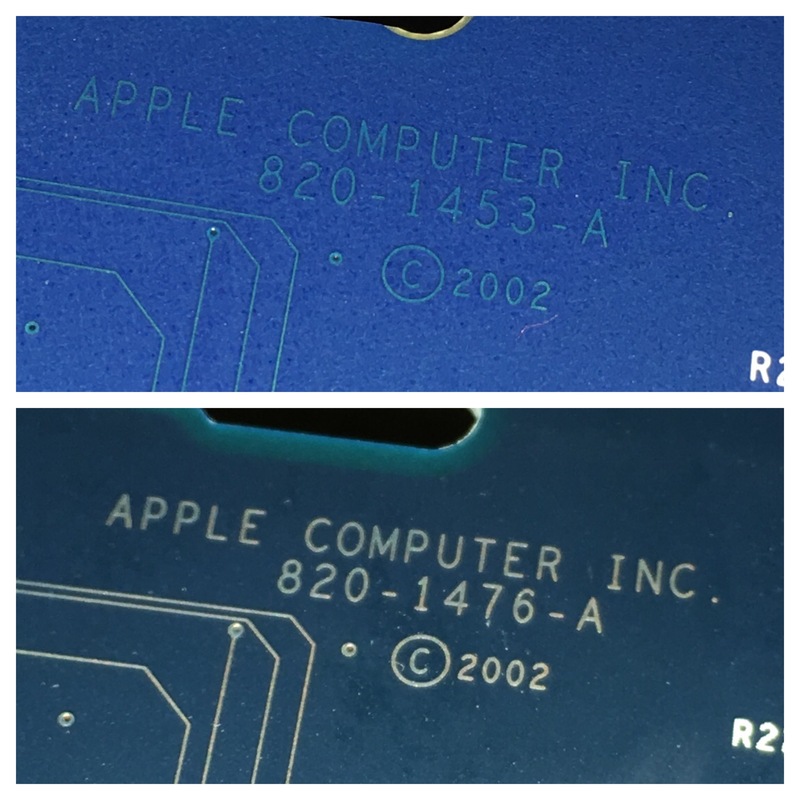 But wait a second… the metal casing of the 2002 is actually much better! 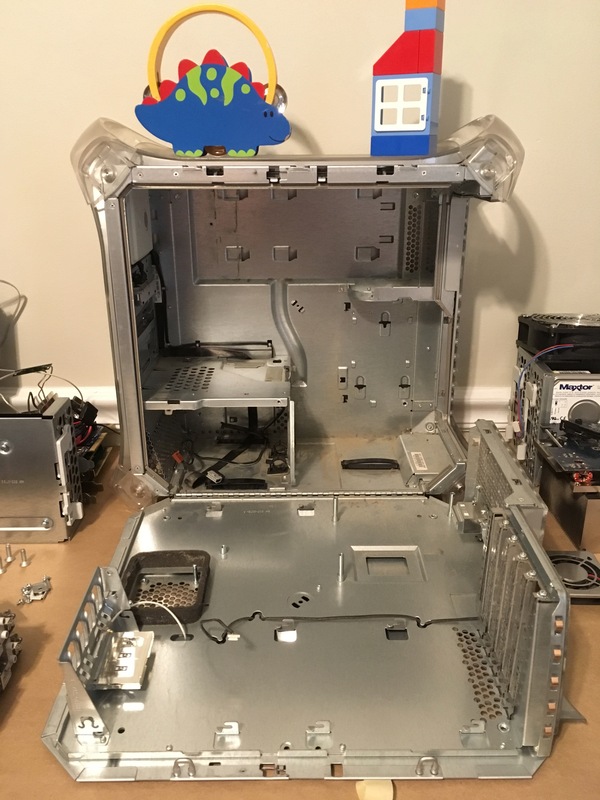 Looks like I’ll be gutting both machines and stuffing everything I need into the 2002 enclosure. I thought I’d just transplant the CPU from the 2002 into the 2003 and be done with it. So why put all this extra work on myself? The metal case is much better ventilated. Yes, my son insisted some of his toys were featured in the photo. As you can see, a lot of the ventilation holes that were present in the 2002, are no longer there in the 2003. 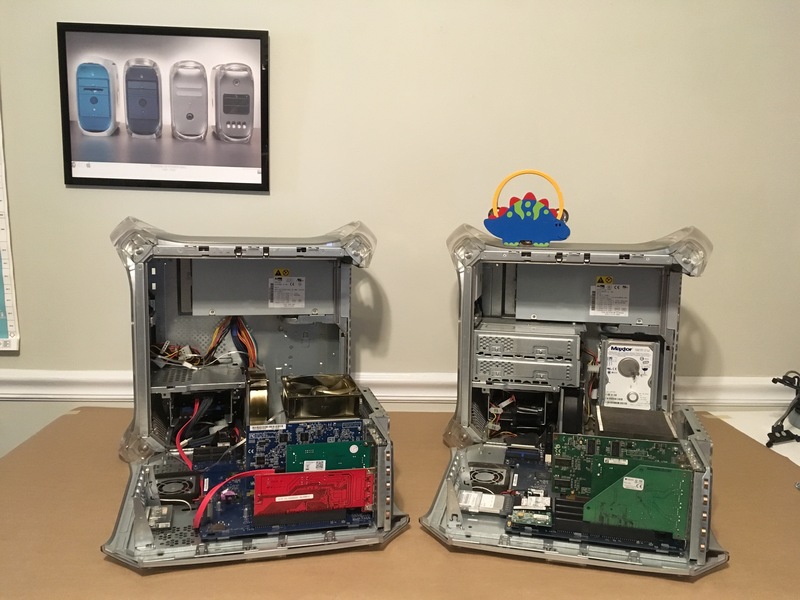 I asked Greg Hrutkay to check his FW800 MDD and that one features an identical case design as the 2003. I have no data to back this up but my theory is that Apple took this route in an effort to make the machine more quiet. 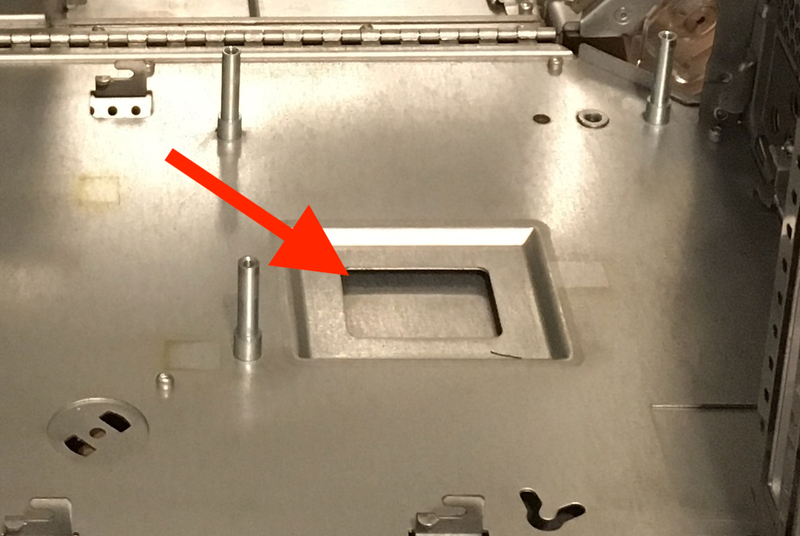 The 2002 has ventilation holes in the door and behind the optical drive bay and the 2003 has none. I don’t care much for the ventilation holes next to the optical drive bay but the ones in the door are very important. You see the big square hole in the door panel? There is no fan that facilitates the air movement I illustrate above (greatly simplified of course), the heat rising off of the heatsink generates that flow naturally. Because the back panel is ventilated, that heat can get out at the top and cooler air can enter from below. This is of course not the case in the 2003 MDD. 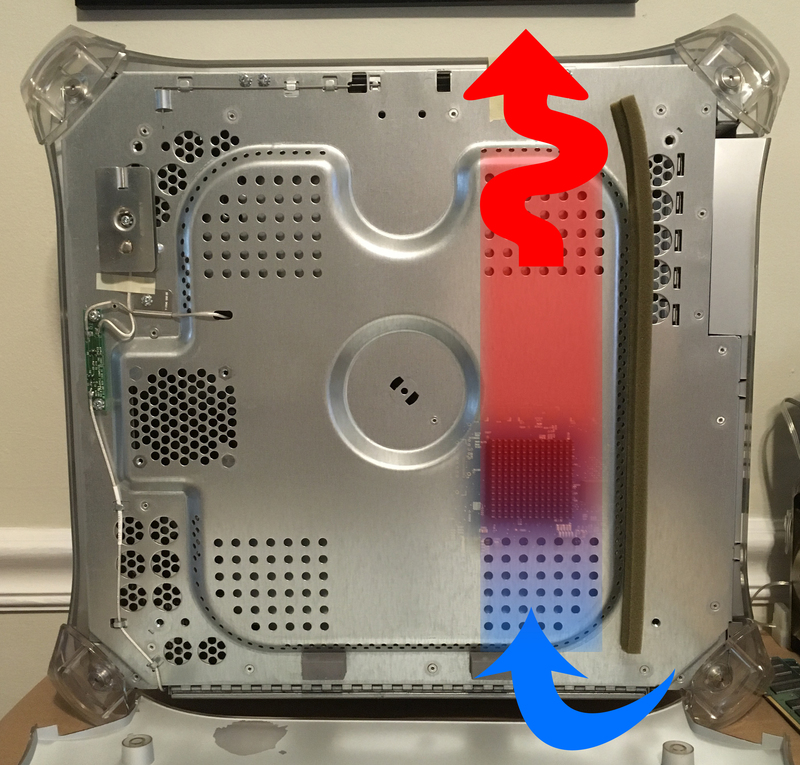 The heat that gets trapped in the side panel only has one place to go; back inside the Mac. 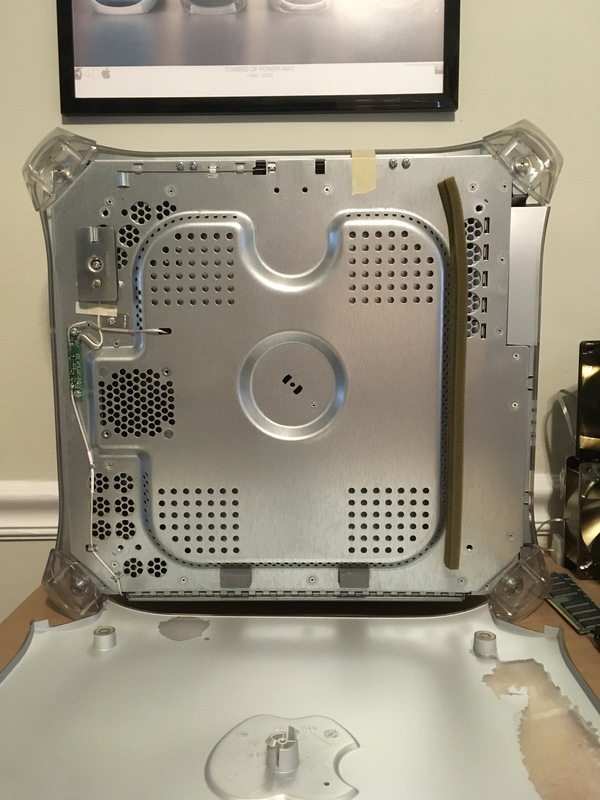 Either through the optical drive fan or the various holes in the side panel (modem cable guides, logic board clips etc). Now the Northbridge heatsink does not stick through that hole in the side cover, it hovers above it slightly. 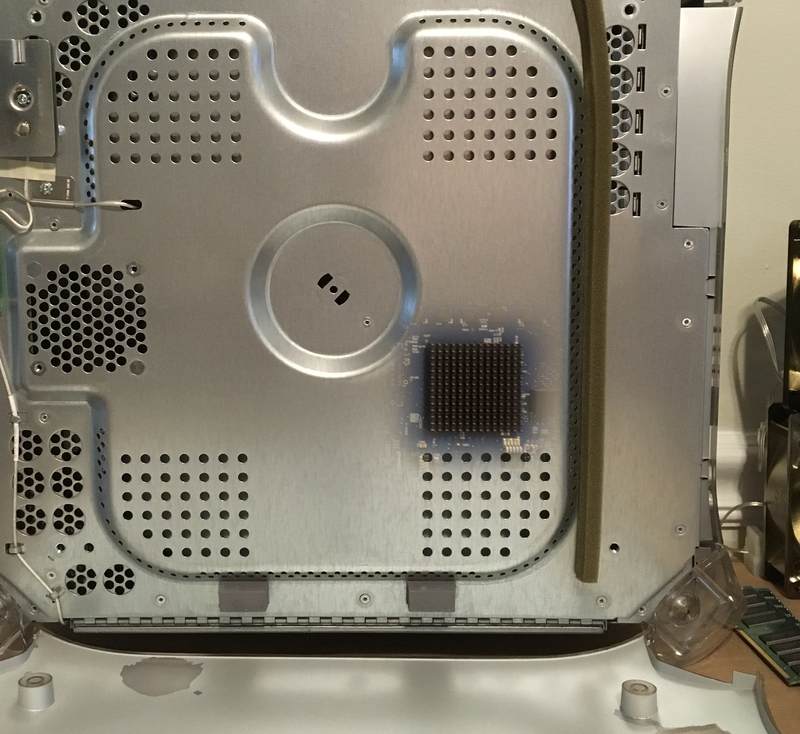 So there will always be some heat that goes straight up from the heatsink into the Mac but most of it does go through that hole and out the side. So Apple’s decision to remove all ventilation holes but leave the big hole for the Northbridge heatsink to push heat out through, makes no sense. Maybe drilling holes costs $0.003 cents per machine and by not doing it they saved a few thousand dollars, maybe it was all about making the machine as quiet as possible or maybe they just forgot. Either way, if I have a choice between a 2002 MDD or 2003 MDD case, I’ll always go for the 2002 MDD (FW400 model). 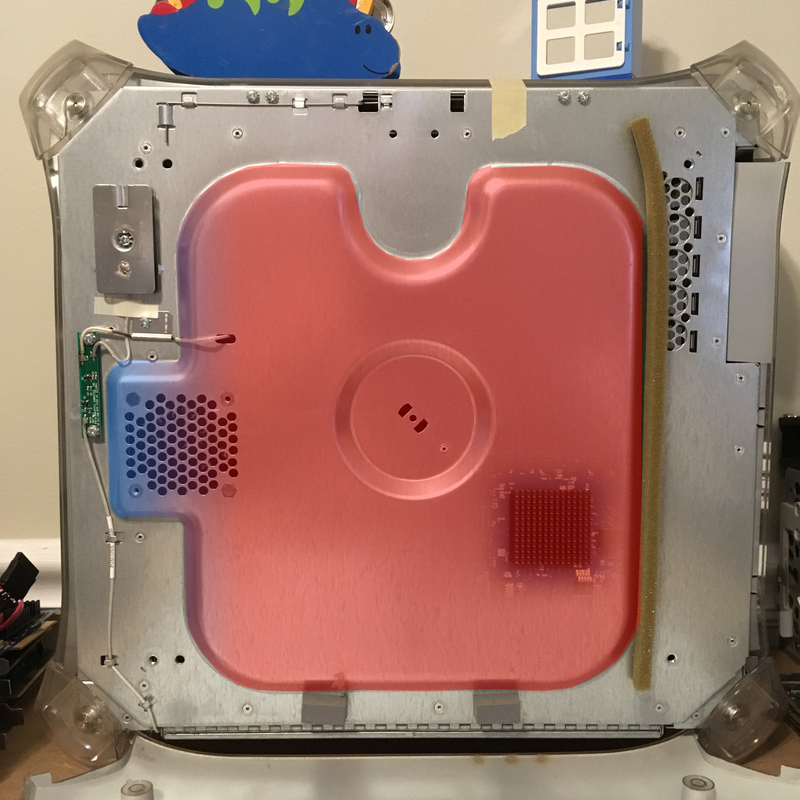 With the, to me, ideal case picked, I did some last minute cleaning and used some heat resistant tape to cover every hole that would allow heat from the Northbridge to come back inside the case, rather than go out the side panel. I removed the AirPort antenna wiring and the modem wiring as those will be two things I’ll never use anyway, so all those holes could be closed up. This should ensure any heat that ends up in the side panel, stays there and vents out the top. 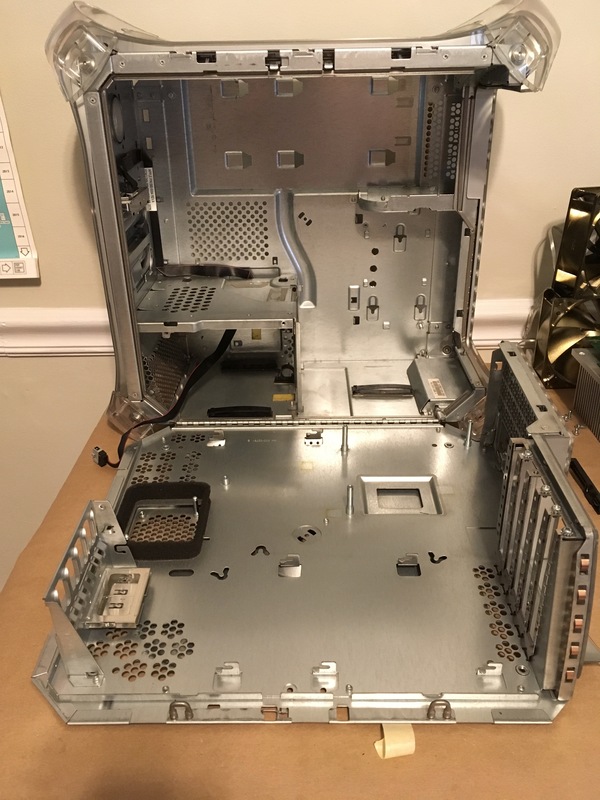 With the case prepped, time to start the actual transplant! Of course I went with the 2003 logic board as it has a few small modifications that make it a better candidate for me. 1. It’s newer which in theory means it has less hours of use on it. If you compare the level of dust in both machines, in this case I think that certainly holds true. 2. 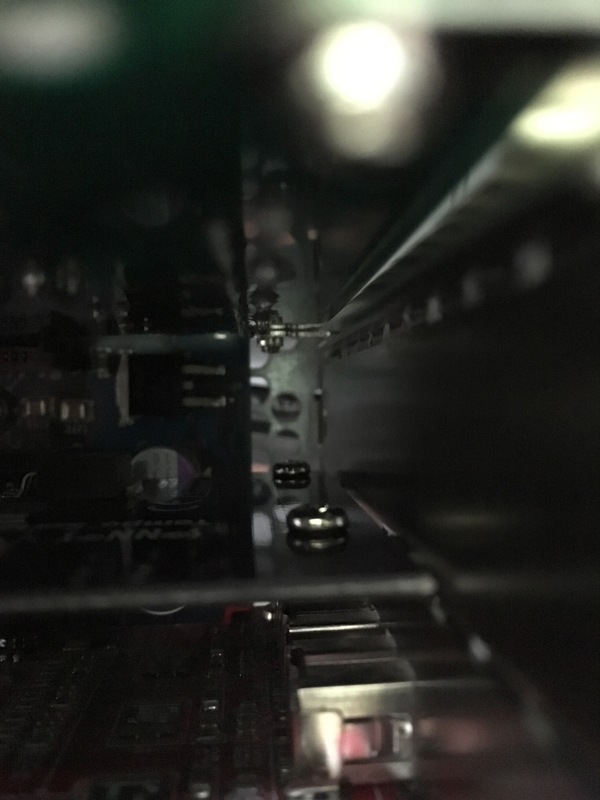 Apple got rid of some excess unused board that enables heat to get out better by the PCI slots. 3. 167Mhz system bus by default so I’ll never have to make any tweaks to get the 133Mhz bus on some older boards up to 167Mhz. I’ll probably never need to worry about this but it’s still nice to have. 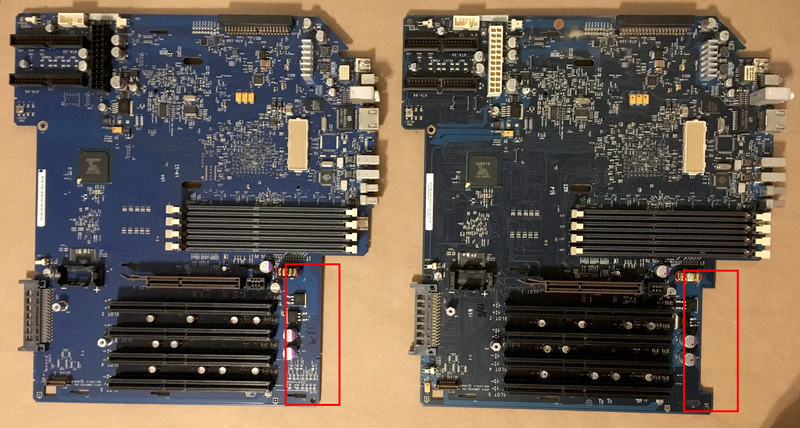 As you may have gathered by now, I’m a nut about thermal efficiency so that little piece of board Apple removed from the 2003 board is a big deal to me. The AGP/PCI area gets very hot so for that hot air to have an easy and additional way out of the case is great. 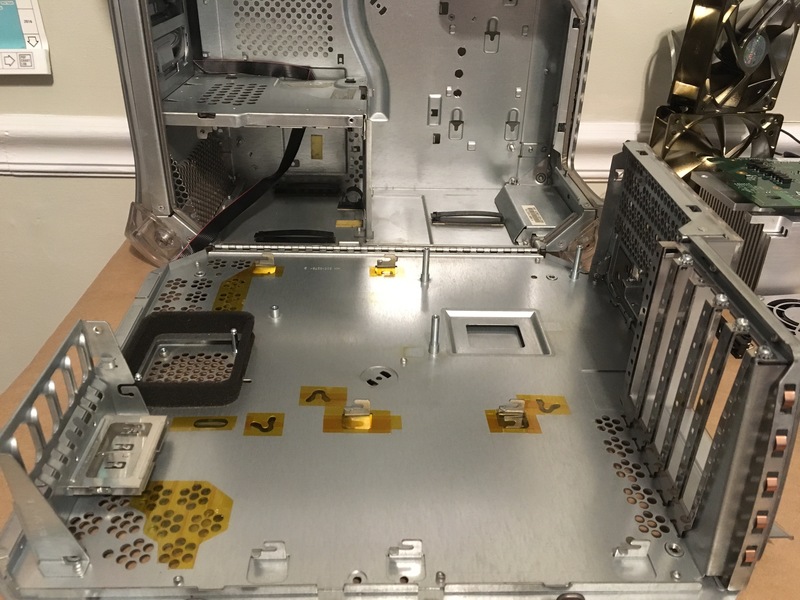 The holes in the case are present on both models but the 2002 board covered them. As small as this change is, it does make a pretty significant difference. I ran both MDD’s with the side panel off and I can feel much more heat come through those PCI holes with the new board. The 2003 MDD board was put in the 2002 MDD enclosure and I started building the system back up. I also transferred the 2003 MDD power supply as it was the upgraded 360W model with quieter fans, the Papst main fan replaced the extremely noisy Delta fans that were used in earlier models and actually runs quiet enough for me to use it. The RAM was transferred over too as it is the fastest this MDD will take, PC-3200 (it still downclocks to PC2700 speeds but from what I recall is still marginally faster. Will test this later). Of course the Sonnet CPU and 2002 MDD large aluminum heatsink went back in as well. I slapped together enough parts to do a test. Connected power, a display and a mouse and pressed the power button. It turned on but just sat there with a black screen. After 20 seconds the quiet Papst fan kicked on to 100% and showed me that it can certainly be very loud if it wants to be! I powered it off and checked to see if I forgot to connect something, all cables were in place and connected properly. Odd… let’s try again. Same result. 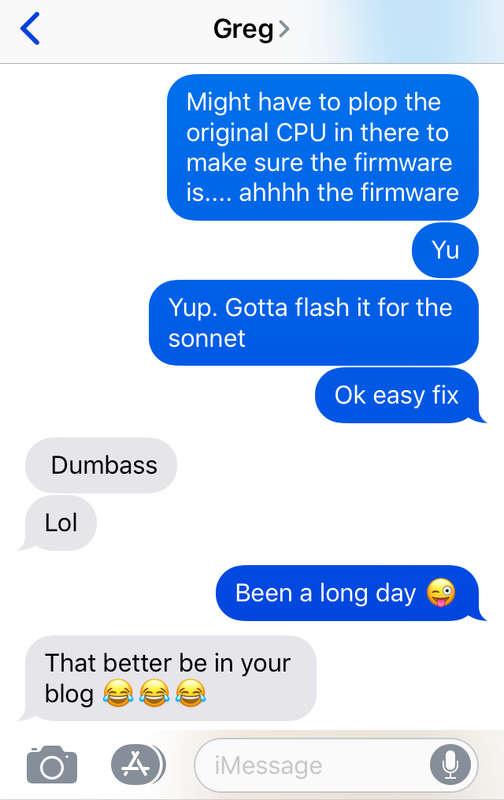 I shared this with Greg Hrutkay who was working on his own MDD adventure (and almost dying in the process) that day and then it hit me; the sonnet CPU needs a firmware patch to work, doh! Yup, not my brightest moment. Ok so the original 1.25Ghz CPU was put in, Sonnet firmware was installed and the Sonnet CPU was put back in. Eyyyyyyy, it booted! And even with the side panels still off it is SO MUCH quieter than before. With the stock fans doing their job properly, I could dispose of the additional CPU heatsink fan I put in there to help keep it around 50C. Now under full load it never tops 55C which I am fine with for now. I’ll be tinkering with the cooling system more later though, because #geek. I’ll probably also put the optical drive cage back in as I no longer need the space to accommodate additional fans. With the internals pretty much done, time to pick and choose which case parts I’ll be using. 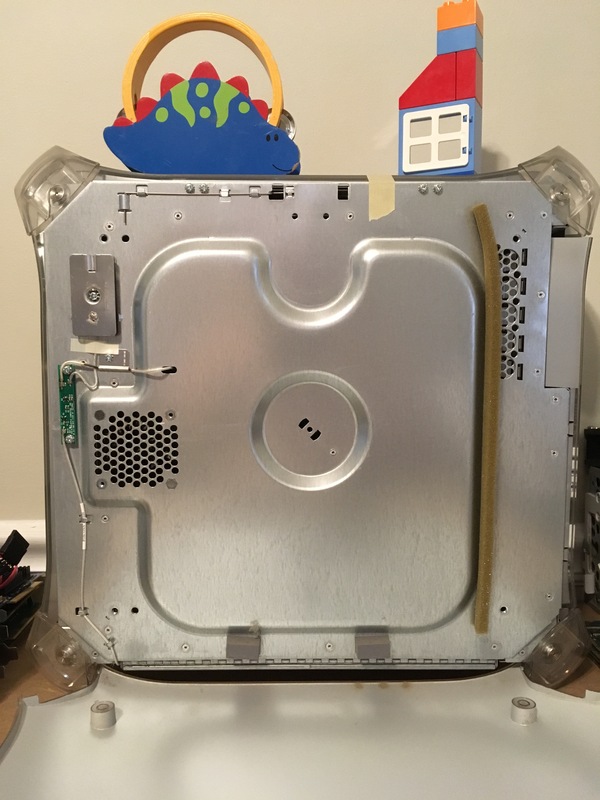 Picking the best of whatever is available, this MDD will not only work great but also look good finally 🙂 So is this still a 2002 Power Mac G4 (MDD)? I think it is, just with upgraded internals. I’ll update this article with the final pictures once I slap it all together.